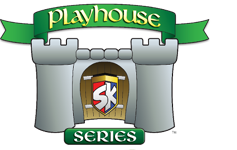 With room to let imaginations grow, the Playhouse Series gives children swings, slides, and a very special place to call their own. Ideal for creative children with active imaginations and families of all sizes. Enjoy a world of make-believe that makes every day different and fun! The C-1 Hideout is small enough to fit in most backyards but packs lots of fun for imaginative minds. 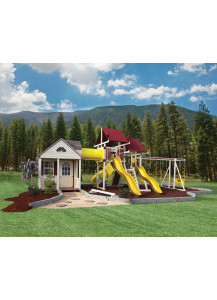 Climb up the flat step ladder to the 5'x6' playhouse, which comes complete with siding, shingles, a door and two working windows with screens and shutters. 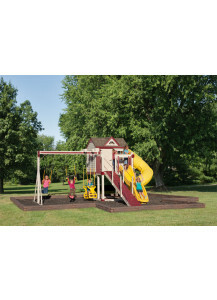 Slide down the 10' avalanche slide to find the sandbox, climber, trapeze and two belt swings. The C-1 Hideout, simple joys and plenty of old-fashioned fun. The C-4 Hideout will keep the fun and creativity flowing. With a rock wall and a flat step ladder up to the playhouse, things will not get boring. Make sure the coast is clear with the binoculars before speeding down the 10' wave slide for a quick escape. Two belt swings and and a trapeze will get those legs moving. With the C-4 Hideout, your family can discover plenty of ways to laugh the day away. The C-2 Turbo Escape is perfect for children that love to slide. From inside the playhouse, you can make a quick exit down the turbo twister slide for secret missions or from the playhouse porch you can steer the ship's wheel then slide down the super fast avalanche slide to make a quick escape. On the ground they can dig for treasures in the sandbox, soar through the air on the belt swing, do fancy tricks on the trapeze, or glide to their destination on the plastic glider. With the C-2 Turbo Escape, there are so many ways to play. 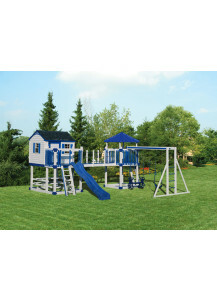 The C-5 Castle is the play set for your prince or princess. The playhouse castle connects to the tower with a bridge, providing a perfect vantage point to protect the land. Should danger be around the bend, the royal highness can escape down the 10' wave slide to safety. Should adventure be sought, they can climb the climber or swing on the belt swing or trapeze or gallop away on the plastic glider. When it's time for refreshments, relax at the 5'x6' picnic table. 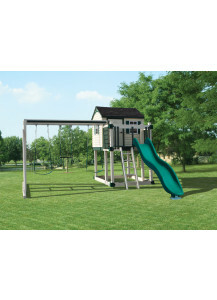 With the C-5 Castle, encouraging your kids to get a little fresh air has never been easier or more fun! The C-8 Bridge Escape has something for the entire family and incorporates many of our best features. Parents can relax on the fan back lawn swing while they watch their children's imaginations come alive. 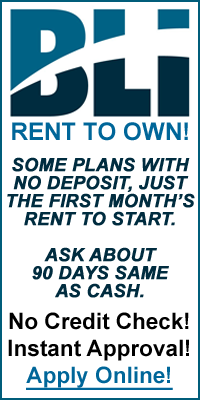 Children can swing on the baby swing, belt swing, three rope tire swing, or on the trapeze. They can climb the rock wall or cargo net to the tower where they will be able to steer with the ship's wheel and look out with one of two sets of binoculars. A short walk across the bridge will get them to the playhouse for lots of pretend play or they can slide down the 10' avalanche slide to get to the sandbox. The C-8 Bridge Escape offers so much, you can invite the whole neighborhood for an afternoon of outdoor fun. The C-3 Tunnel Escape offers great big fun for everyone. Climb up the flat step ladder with access railing to the playhouse where the steering wheel is ready for pretend driving. Exit down the 10' avalanche slide from the porch or climb through the 5' tower tunnel from inside the playhouse to get to the two tiered tower. Use the periscope to check your surroundings before peaking through the bubble panel or racing down the turbo twister slide. 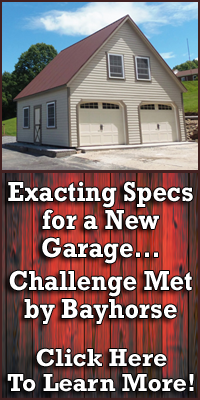 Once on the ground, relax at the 5'x5' picnic table or sift through the sandbox. But wait, we haven't gotten to the swings yet and there are four to choose from! Bring a friend for the horse rider or basket glider, show off your daredevil skills on the trapeze or go up in the sky on the belt swing. The C-3 Tunnel Escape is like an amusement park in your own backyard! The SK-60 Cottage Escape is truly an escape in your own backyard. The adorable 8'x8' cottage, complete with front porch is perfect for pretend play. Through a 5' tower tunnel, children can exit the cottage to the two tiered tower that boasts a ship's wheel, periscope, plus our three fastest slides. There is a rock wall, cargo net, and monkey bars for the climber plus a balance board to work on large motor skills. No need to fight, because the SK-60 Cottage Escape has a swing for everyone. There is a baby swing, belt swing, trapeze, three rope tire swing, plastic glider, and a hammock swing if you want to slow things down a bit. The SK-60 Cottage Escape, a happy place to call their own. An inspiring place to enjoy year after year.